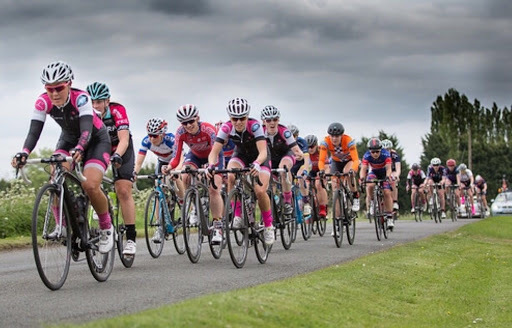 Thanks must be given to John Miles and team for putting on another edition of the Bedford 3 Day, part of the women’s team series that enables grassroots teams from across the country to compete against each other. 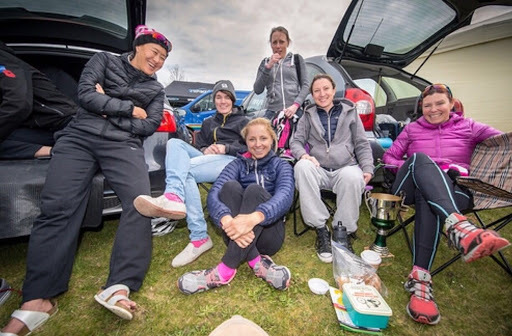 Support crew – wives, girlfriends and riders themselves provided wonderful home-baked goodies and moral support. Merci! 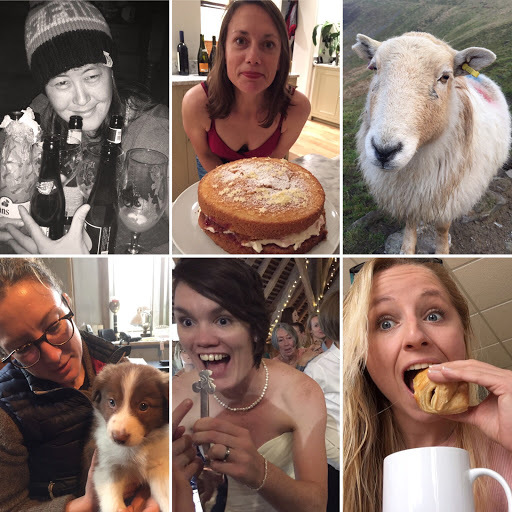 The whole weekend was probably more like a hen-do than a stage race. 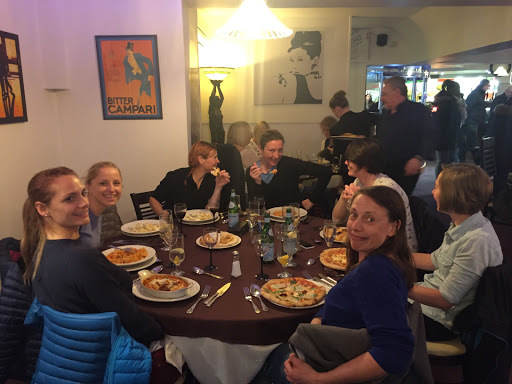 Our fantastic team had an average age of 36. This meant we could share stories about Ocado deliveries and get our own ages confused over a bottle of red, or 4, which we did each evening. We laughed over the real but funny names of people we’ve worked with, ate some wonderful chocolate brownies and a chilli thanks to KB, and went on a linguistic world adventure discovering terms for ‘foo foo’ and the parts of it which hurt most. We nearly ground to a halt when there was no tea or cake on either day 2 or 3. We somehow struggled on…. In less than 6 minutes we all reduced ourselves to wheezy, coughy, lungless messes. We had 5 Les Filles QOM riders within (about) 30sec of the Yellow jersey, which was a solid result and gave us options (I swiftly opted not to remain there). An eye-opening neutralised section followed by a race which we all survived. Nic had a go off the front but was soon reeled back in. Karla, Nic, Delia and Lou, finished in the bunch (despite bad crash in last kilometre). Now 4 Les Filles QOM riders in top half of the field. We may have been reprimanded for “inappropriate language, especially in the presence of children”. Apologies. Very glad to hear that riders who had come down were back on their feet the next day. Riders: Please do not put the safety of others at risk. No one wants to see anyone get hit by a car. It may be legal to cross the white line, but it can also cause accidents. As one team member so eloquently put it, “You may be able to bungy jump without a rope, but it doesn’t mean it’s a good idea”. I wasn’t really in this race because I got a call from TC, to say that there were some missing kittens. We had to track them down and save them from the evil professor. You can see from GC who else helped us on our mission. We sacrificed our race but got those kitties back home. We put in lots of practice in the 16 mins getting to the start. This TTT was fast and hard, TC sacrificed herself and got us off to a fast start. This was my favourite part of the racing: busting a gut with your mates, wearing colour-coordinated Velotoze – does it get any better? 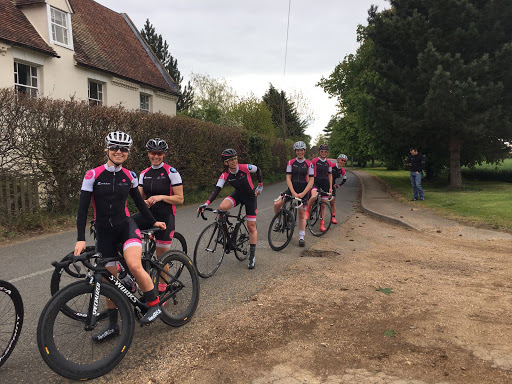 Well done to Team On Form who cemented their lead and won the TTT too. We were very happy to get joint 2nd with the mighty Ford-EcoBoost Team, and just pip the slick HSS-Aprire team by 1 second – tight as! Really shows how every second counted. Interesting start with race cars in the peloton. Very windy day. 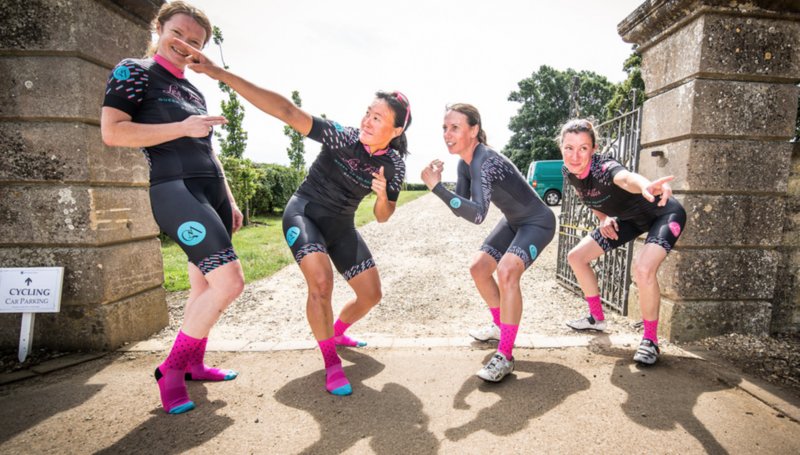 Karla, Nic, Delia and Lou finished in the bunch and remained high up on GC, with KB sneaking into the top 10 despite having “sh*t legs”. 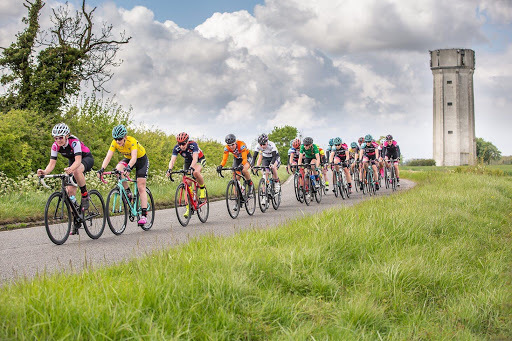 Special mentions to Alice Lethbridge riding for Lovelo-Cinelli, and Emma Lewis (sometimes known as Amy Jones) of HSS-Aprire, who by many accounts were responsible for much of the pace-making which made this stage a lot safer. Don’t know how race played out because TC and I got a call. A strongly-accented dictator of a country that doesn’t exist was planning to kidnap our Queen and hold her for a ransom of 1 million Corgis. We moved fast. Can’t reveal the details, but let’s just say that Her Majesty didn’t miss a minute of the Eastenders omnibus. Another interesting start with fastest neutralised yet out of HQ. Another windy day. Lou attacked but was closely monitored, and with GC separated by very few seconds nothing was let go. Nic soon followed with another go at practicing her time-trialling to no avail. 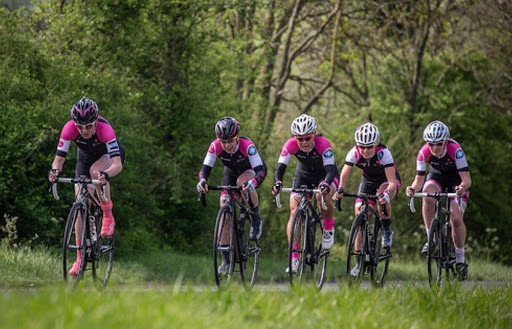 Karla, Nic, Delia and Lou once again finished in the bunch, maintaining their high GC places. Phone rings. TC and I sprang into action. An alien life form, threatening to take over the world? We overhelmed those aliens with our cunning and caffinated gels. You say heros. Maybe, we say, chewing a toothpick standing in a badly-lit alley, some things are worth a DNF. Well, at time of writing we’re not 100% sure what the results are, but we think we may have got 2nd team overall, with Lou and Karla in top 10 on GC, Delia and Nic in top 15, but we won’t know until results are finalised. Not sure if the Asbo tags were a help or hindrance to the race.